Whether you are a freelancer or a small business owner, you always want to make sure you have systems in place that run efficiently in your business. When your systems work well, you have more time to focus on what you do best, and this means more time for billable hours, too. One of the most essential systems in running a translation or interpreting business is the one in which you manage all of your tasks and projects. I'm not talking only about client projects, but also those projects that don't necessarily bring in any revenue, like invoicing, planning a marketing strategy, preparing social media posts, writing blog posts, reaching out to prospective clients, planning days, you name it. I first presented about this free tool at the American Translators Association annual conference in New Orleans (October 2018), and those who attended my session were very excited to learn about it. The audience was made up of a range of professionals, from freelancers to agency owners and committee volunteers to chapter presidents. I was blown away by the number of people who thanked me for suggesting this tool to them. Some of them even downloaded the Asana app right after the session! Before I made the switch to Asana, I was using a few different tools to keep everything organized in my business. It didn't seem like a complicated system at the time. It did the job, but I didn't realize how much more organized we could be by keeping everything all in one place until we found Asana. I'd tried several of the project management tools that are meant for T&I businesses, but I found that none of them can do all that we need them to do. And as I don't have the budget to create a custom project management system at this time, I have found Asana to be a truly dynamic and easy-to-use tool both for myself and for my team. I also use Asana to organize my own freelance and volunteer projects. It's so dynamic! And do you want to know the absolute best part?! It is free. That's right. I don't pay a dime to use it and I can add as many people as I would like to a project within my organization. It is free for them, too! Even if you are a solopreneur and have no plans to hire anyone for your business, this project management tool will change the way you do business for the better. It will keep you organized and planning things from start to finish. It will help you with your workflow and really give you the full picture when it comes to long-term goals and planning. Here's a view of my Dashboard when I first open Asana in my web browser. All of your projects are organized however you like, but what I love is that you can color code them and move them around however you like whenever you need. Besides the Dashboard view, you can easily access all of your projects in the left-hand sidebar by scrolling down. Here's an example of how I organize my blog posts for the blog you're reading right now! We use Asana to keep track of our client projects, as well as inquiries we get from prospective clients who might not yet be ready to hire us for a project. You can set up a template for the projects you tend to have the same steps for over and over. We've done this with our prospective client and current client pipelines (like the one you see above), and it couldn't be easier. No reinventing the wheel for each inquiry you receive! Asana also integrates with so many programs that we already use to keep files organized, like Google Drive, Dropbox, etc. We are able to email tasks to ourselves that will show up in Asana, use the app on our smartphones to add tasks and respond to items in the conversations feature, and so much more. And I just found out that I can also turn handwritten notes into tasks and get Siri to add tasks for me on my iPhone. What?! I've already told you that we organize the projects we have to do as teams, but I also have projects for which I am the only "team member" (things like administrative tasks, reminders about making tax payments, completing payroll, etc.). Here is a screenshot of a few tasks that would only show up in my own administrative projects view. I'm able to set deadlines and assign them to myself so that I receive a reminder notification on the day they're due. 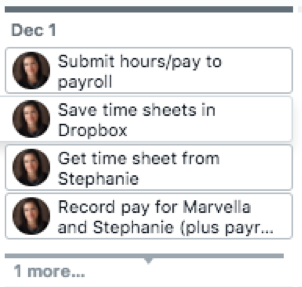 If you're someone who likes to be able to see a full calendar view of your tasks (as well as those of anyone you may add to your projects), you can switch to the Calendar View very easily. Or you can see everything in a List view, if you prefer. There is also an Asana app for Smartphone users, so I can access projects and files from my phone if I'm traveling, running errands or just out of the office. And I can even add tasks to projects straight from my email that will show up in this tool whenever I want. Now, I'll be honest and tell you that Asana isn't the most intuitive program to use at first. But! If you stick with it, you will find that it is worth learning how to use it properly. I personally didn't have a lot of time to learn how to use the tool through trial and error, so I did a little research and found an online course that breaks down exactly how to set up your Asana account for your business. This class is the best. I was able to set up my Asana account to be the workhorse for my business. My project managers are also in love with Asana now. And no, that's not an exaggeration. If you are interested in setting up an organizational system like this for yourself and/or for a team you work with in your T&I business (even if it's just for you and your accountant! ), I highly recommend you check out Megan Minns' course Asana HQ. Truly, it is worth taking the course so that you can see the full capacity of Asana and all of its free features. I learned so many things about how to use Asana that I would have had no idea about had it not been for this course. Megan gives tips and tricks that you likely wouldn't be able to figure out just from signing up with a free account and tinkering around in the program. If you're not sure how Asana can work for you, I would suggest just watching this video and seeing if this type of organizational system would help you in your business. Even if you are a freelancer who usually works as a solopreneur, using Asana to get your operations and client management down pat will make you so much more efficient. Asana can get your processes and workflows so organized, you'll feel like a new person. Again, not an exaggeration. Besides, you may not work alone forever, and if you have everything set up this way already, it will be easy to bring on someone else in the future!